Many Dubliners tend to stay away from the Temple Bar area when it comes to dining out but there is a little Indonesian restaurant that has been there since 1994 and is always a winner for me. Chameleon restaurant Dublin is located only a few seconds away from Temple Bar square, this restaurant serves contemporary Indonesian cuisine. The offering from their spice bar on the ground floor is a casual version of their main menu - ideal if you’d just like to have a few bites and drinks, or are a bit more rushed. Upstairs in the Bali room the purple walls are lined with mirrors, fairy lights hang from the ceilings and the low table sitting areas have plenty of little cushions on which to make yourself comfortable. The setting is romantic and atmospheric for couples but also a favourite for groups looking for something different. So how is it different to other restaurants? Chameleon serves Indonesian “rijst-tafel” (rice table) which are like tapas: small Indonesian dishes served on your table at the same time. When you’re seated at your table the staff always ask you if you’re familiar with their concept and will explain it if you are not. You’ll find five different “rijst-tafel” on their menu ranging from €20 for the pre-theatre on to €35. Each “rijst-tafel” includes five to seven dishes served with condiments and basmati rice. You choose the one you’d like and then you’re brought empty plates and hot plates. It’s recommend to order one “rijst-tafel” per person and it’s best to choose a different one from your dining companion, so that you can share and try as many dishes as possible. The amount of food is quite intimidating at first but it’s a lovely experience. The Komodo “rijst-tafel” is one of my favourites. Their chicken satay, served with peanut sauce is wonderfully tasty and so are the crispy marinated squid rings with sweet chilli dip. In the Lombok “rijst-tafel”, dishes such as the chicken wing in a chilli and tamarind sauce and the Javanese short rib of beef are some of the highlights. The menu also features sesame fried vegetables, bami goring (wok fried noodles with beansprouts, ginger, garlic and soy sauce) and an amazing slow confit of Fermanagh black pork belly which they marinate in dry spices for two days. Chameleon is a great spot if you’re looking for some exotic food and a more sociable dining experience that just having a regular three-course meal. The service is always welcoming and attentive and the food will make you feel you have travelled to beautiful Indonesia, without ever having to take a plane. 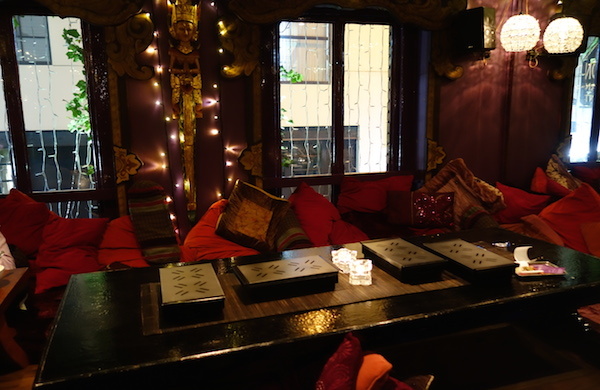 Browse our deals for more places like Chameleon restaurant Dublin here: Dublin restaurants.